Please accept this picture of my boy BLUE for consideration in future monthly picks. He is six months old black and red. And as you can see he enjoys his Ice while relaxing in his yard. Thank You. Hello R. Powell, and thank you so much for sharing your cute little story about your new German Shepherd puppy Blue. What a wonderful little story. My own German Shepherd puppy loves eating ice too - especially after being outside in the heat for any period of time. 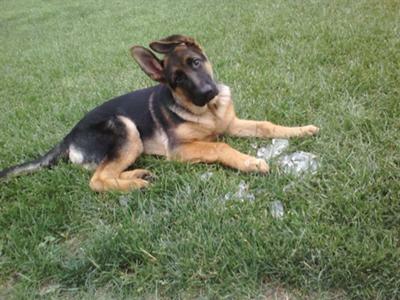 I also have had several other German Shepherds that loved ice too - especially playing with it. In fact, I had one German Shepherd puppy once that loved ice so much that she could bat it around so well that she could have easily held her own with any professional hockey player - well, a high school hockey player anyway. Ice is definitely one of those things that German Shepherd puppies can have a great time with - and definitely one that you don't have to worry about too much either. And I hope that Blue gets a chance to play with ice often if he likes it that much.